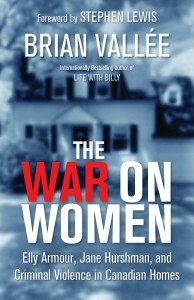 The man who wrote THE book on battered women in Canada, international bestselling writer Brian Vallée returns to the domestic battlefield. In The War on Women Vallée revisits the domestic battlefield, revealing that the War on Women by the intimate men in their lives continues; that the fallen in this War are more likely to be ignored than honoured; that the refugee camps of this War are called “shelters”; and that the number of men being killed by their spouses has dropped by more than 70 percent since the inception of shelters, while the number of women being killed has dropped by less than 25 percent. That’s right, shelters save men’s lives! Vallée was compelled to revisit the domestic battlefield when he was contacted by Calgary music promoter Elly Armour, who harboured a dark secret. She had once been a battered wife. In Nova Scotia in 1951, her husband brutally beat her and forced his way into a locked room where she was trying to hide. A teenaged mother of two with a third on the way, Elly shot her husband dead with his own hunting rifle. She was charged with the capital murder of Vernon Ince. Through the years, Elly never talked about the shooting or the abuse. Not until more than half a century later when, her health failing and upset at the number of women still being murdered and abused by their intimate partners, Miss Elly contacted Brian Vallee and asked him to reveal her secrets.